WRENTHAM, Mass. – Throughout the 2018 season, King Philip junior Caroline Klim has emerged as one of the Warriors’ go-to goal scorers. 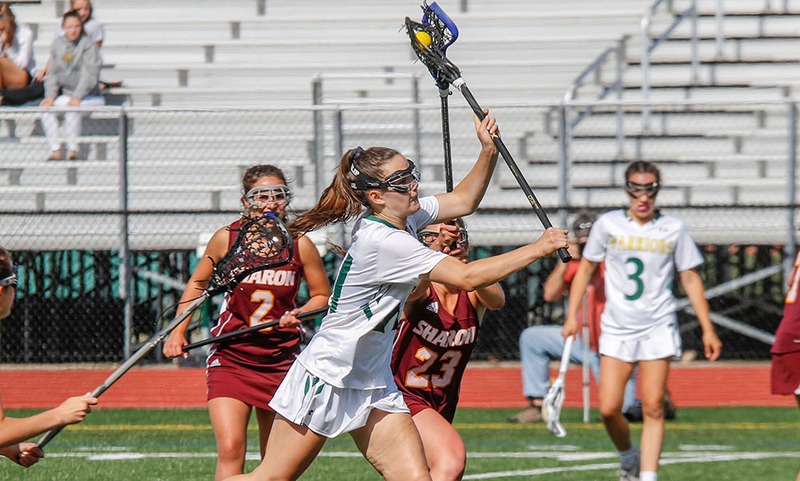 That was the case once again on Tuesday afternoon, as Klim scored nine goals, including the 100th of her career, to lead #5 King Philip past #12 Sharon, 16-8, in the first round of the MIAA D1 East Tournament. “She’s one of those players that always has a chip on her shoulder, she’s confident that when she shoots that it’s going to go in and I’m glad we had some other girls play like that today as well,” said King Philip head coach Kourtnie Wilder about Klim. Klim got off to a quick start, as just thirty seconds into the game she scored her first goal to put KP up 1-0, and a few minutes later Jessica Sullivan (four goals, assist) put the Warriors up to 2-0. Rose Wald came up huge for Sharon throughout the first half with six saves, including three point-blank stops early in the first half. Sharon took advantage of their solid defensive play early, as Emma Eberhardt scored back-to-back goals just minutes apart to tie the score at two. Klim scored her second goal of the game with 14:28 to play, and from their KP never looked back, scoring another seven unanswered goals and jumping out to a 10-2 lead early in the second half. With the game at 5-2, Klim scored her third goal of the game off a free-position, and minutes later scored again to give KP a 7-2 lead heading into the half. Just under a minute into the second half, Dana Truini scored off a free-position to extend the Warriors’ lead, and with 21:59 left to play Olivia Tormey scored to make the game 9-2. Sullivan scored her fourth goal of the game a few seconds later to put the finishing touches on the eight-goal KP run. Sharon broke the drought with just over 18 minutes to go in the game when Eberhardt scored the third of her six goals on the game. A few minutes later, Sharon capitalized on a free position, as Maeve Barbera took advantage of the open space to find Lydia Chase wide open in front of the net to cut the lead to 10-4. Klim scored her fifth goal of the game a few seconds later, and four minutes after that Sullivan found Alli Meehan for a goal to put the Warriors up 12-4. Back-to-back goals by Klim, the second of which was the 100th of her career, would extend the KP lead to 14-4 with 4:41 left to play, but three straight Sharon goals, including two by Eberhardt, would give them some life with the score 14-7, but Klim’s eighth and ninth goals of the day ended any hope of a comeback. With the win, King Philip moves on to play Lincoln-Sudbury at L-S on Thursday afternoon. L-S advanced with a 15-2 win over Mansfield on Tuesday afternoon. The winner of that game moves onto the D1 East semi-finals where they will play the winner of Natick-Walpole. SHARON, Mass. – Colleen Carchedi is used to winning games in the postseason, but when she became the Sharon head coach three years ago, the postseason wasn’t something the Eagles were familiar with at all. 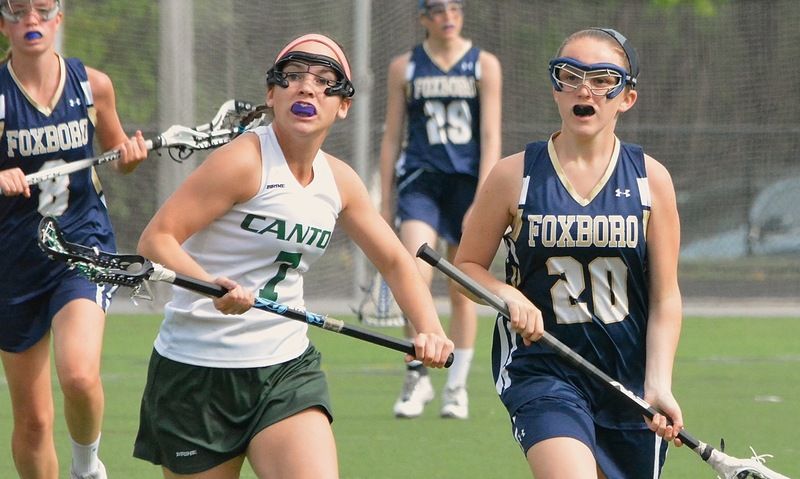 Carchedi, a former standout player at King Philip and former assistant coach at Foxboro, and her sixth-seeded Eagles recorded the program’s first ever playoff win, holding off #11 Newton South for an 13-12 win. Sharon built a big lead by halftime, taking a 9-3 advantage into the break, but had to hold off a furious rally from the Lions, including a late 8-meter attempt. The Eagles qualified for the state tournament for the first time a year ago, but bowed in the first round after a competitive game with Bishop Feehan. This time around, that experience paid off. 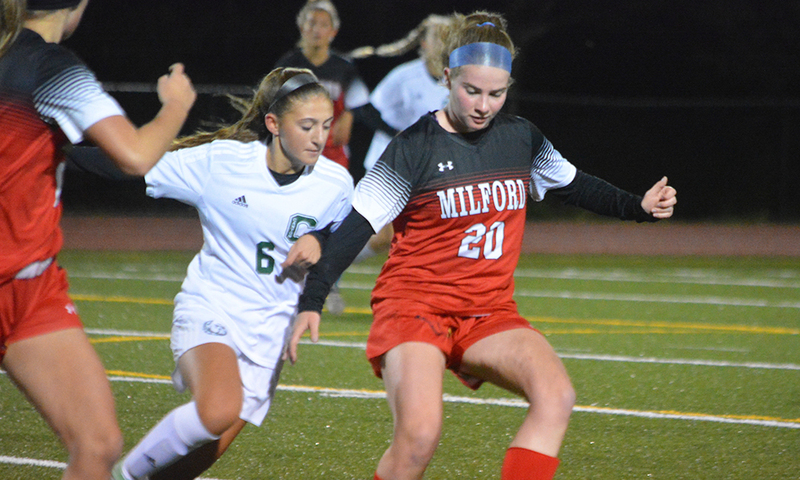 Sharon scored four of the first five goals of the game, rattled off a 5-0 run to create separation in the first half, and came up with a timely goal and timely stop in the final three minutes. Sharon opened the scoring with a pair of nearly identical goals less than a minute apart. Senior Anna Crosby found classmate Alex Rabb cutting right in front and she quickly put the Eagles up 2-0. After Newton South cut the lead in half, Crosby grabbed her third point of the game. She took possession and rounded the net, taking an angle and firing. Shot in the back of the net. Minutes later, Crosby had the ball knocked out in a sea of defenders but quickly scooped the ground ball and fired from in close to make it 4-1. The Lions netted back to-back goals to cut the deficit to a single goal once again, but that’s when Sharon had its most impressive run of the game. Sophomore Emma Eberhardt dodged one defender and bounced her shot in to make it 5-3. Eberthardt grabbed her second shortly after, faking a spin move then faking a shot up high before going low to make it 6-3. Rabb netted her third goal of the game, weaving through three defenders from behind the goal and tucking one it to make it 7-3. The Eagles tallied twice more in the final two minutes with Eberhardt and Rabb each scoring once more to take a 9-3 lead into the break. As well as Sharon finished the first half, Newton South seized the momentum in the second half. The Lions and Eagles traded goals early on, but a 3-0 run from the visitors quickly closed the gap to 10-7. 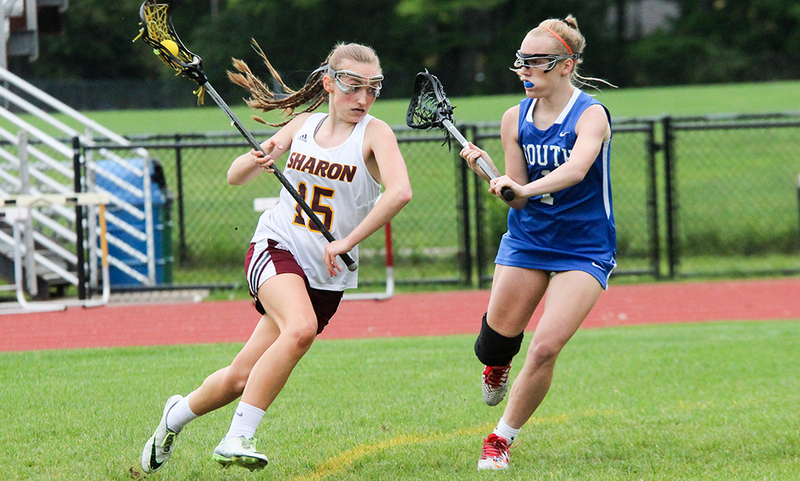 As Newton South looked for a fourth straight goal, the Lions had their offensive possession come to an end due to a great defensive play from Lydia Chase gave Sharon the ball back. The Eagles took advantage of that and snapped the run when Sabrina Robbins grabbed a ground off a save and found the back of the net to make it 11-7. The teams once again traded goals with Eberhardt giving Sharon a 12-8 advantage with 8:22 to play. But once again, Newton South had another offensive run. The Lions netted three straight goals over a two minute span, closing the gap to just one, 12-11, with just over four minutes to play. Sharon came away with a big draw win and took off over a minute of game time with its next offensive possession. Rabb buried her fifth of the game with three minutes to play to restore the Eagles’ two-goal lead. Newton South closed the gap to one again with 1:42 to play but couldn’t beat Sharon goalie Rose Wald (eight saves) the rest of the way. The Eagles’ defense came up with a big turnover and on Newton South’s final offensive possession, the Lions had an 8-meter attempt with 11 seconds to play but a false start gave Sharon the ball back. Sharon girls lacrosse (15-4) advances to the D1 East quarterfinals to take on #3 Westford Academy. The game is set for Thursday, June 1st at 6:30.